BTT 2 second tier done 002, a photo by tygger428 on Flickr. This is about halfway done more or less. Each tier is worked entrelac style, off the selvedge edge of the prior tier. Tier 1 is two base triangles, the bottom and front waist band. The 2nd tier is the “body” block. It is looking a lot less HUGE than the first one I did, so I have hopes it will actually fit me. 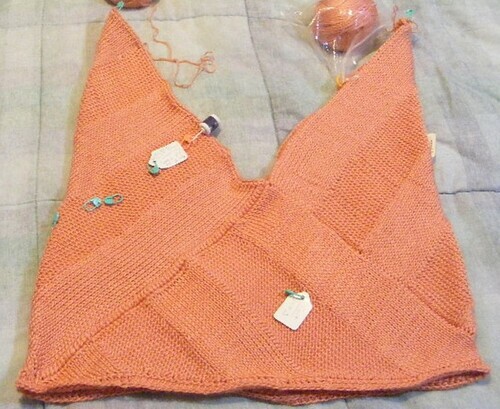 I’m making this too and have just finished the base triangles and the first row along the selvedge edge of the first base triangle. I cannot for the life of me figure out how to do the next bit, which reads, “Insert hook from front to back in sc at edge of 2nd base triangle and pull up a lp (2 lps on hook), tks in next 11 (12, 13, 14, 16, 17, 19) sts, tps in next 11 (12, 13, 14, 16, 17, 19) sts, tks in next 11 (12, 13, 14, 16, 17, 19) sts, tps in next 11 (12, 13, 14, 16, 17, 19) sts, tks in next 12 (13, 14, 15, 17, 18, 20) sts; RetP to last 3 lps, yo and draw through all 3 lps on hook. It seems impossible to do the front to back thing with the RS facing, and I don’t understand how only these two rows make a whole square. How would you explain it? I did manage to complete this tee, twice, but it was so long both times, it was more like a T shirt DRESS. Both versions have been donated to charity as I cannot wear them. I tried to contact the designer via Ravelry, but she has not replied. The base triangles I think are too tall, for this to fit me, I have to figure out how to rewrite it to shorten the body. It fit me “around”, the circumference is fine, but is way too long.